It’s been a busy few weeks around here, but I wanted to post this week about a few things I was able to complete. 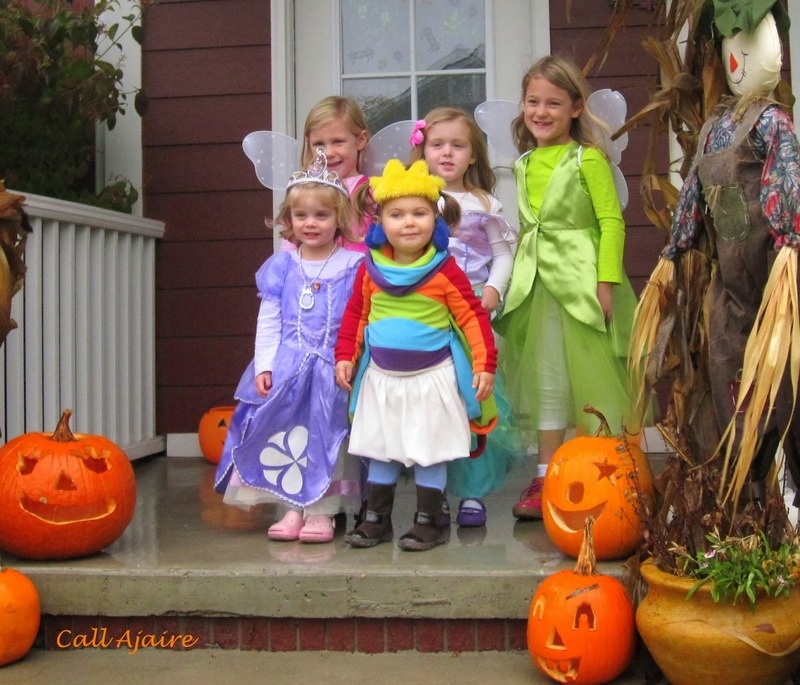 First, the Halloween costume. 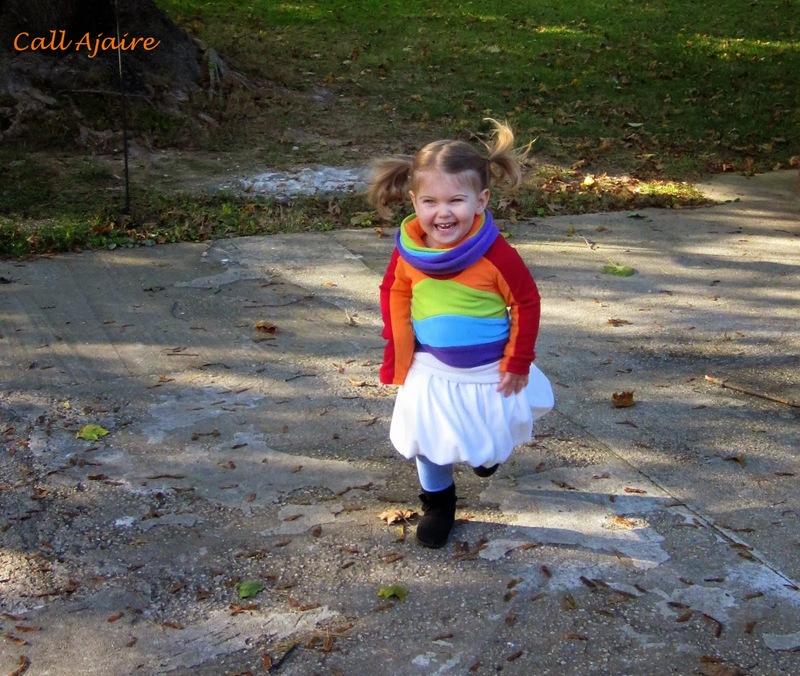 Bean calls every arch a rainbow lately so when I asked her what she wanted to be for Halloween she said a rainbow. I wanted to make a costume that could later be worn as separates (see the two previous year’s costumes here and here), so I went the sweater/bubble skirt route. 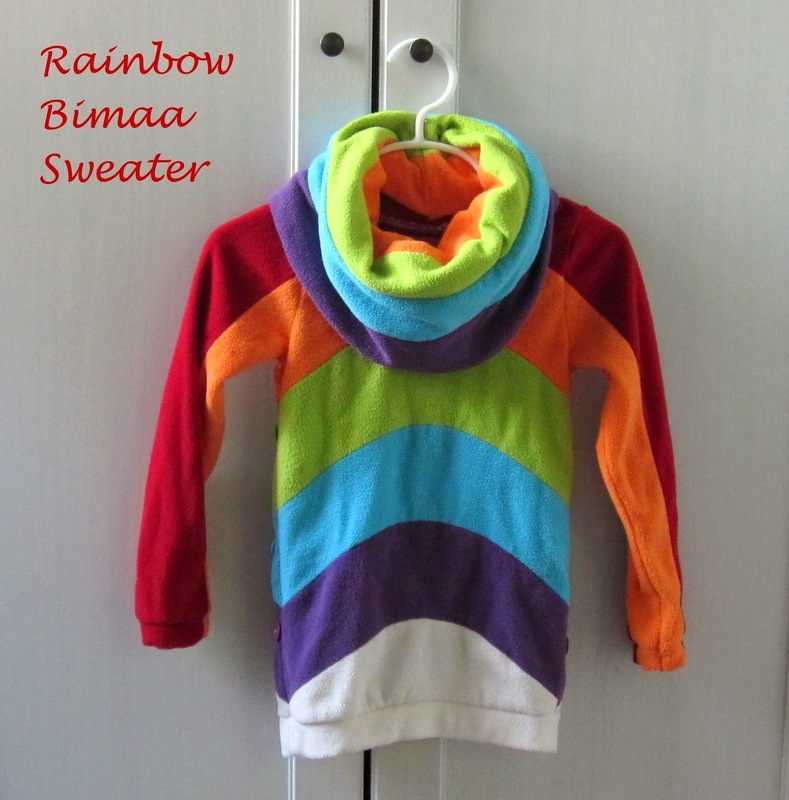 I took the Bimaa Sweater that we all know and love, and color blocked the pieces to make a rainbow in the front and in the back. 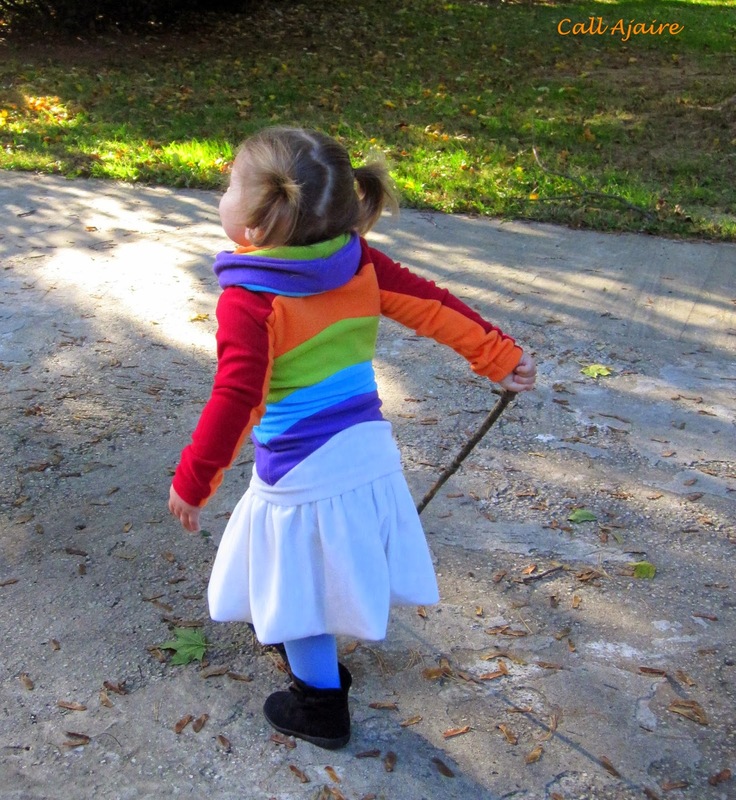 I was originally going to make the hooded version, but then I got the idea of a warm microfleece pieced rainbow cowl swirling around her neck and I couldn’t get it out of my head. 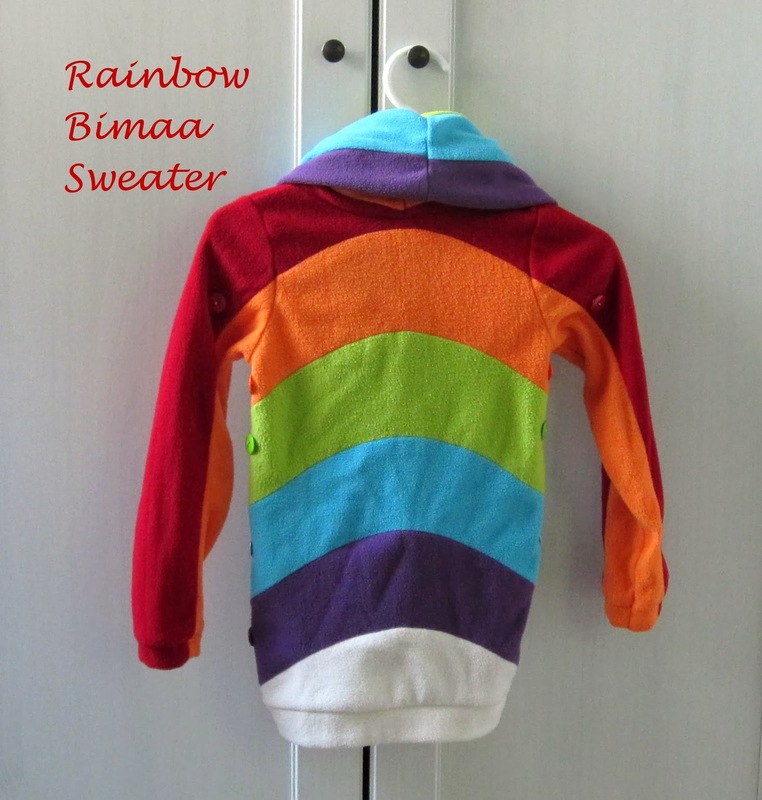 I added buttons down the sides of both the sweater and the skirt to connect strips of fleece to exaggerate the stripes of the rainbow. Once Halloween was over I removed the buttons so Bean wouldn’t catch them on everything. Although, they were sort of cute on the skirt. The skirt is a cozy microfleece as well. 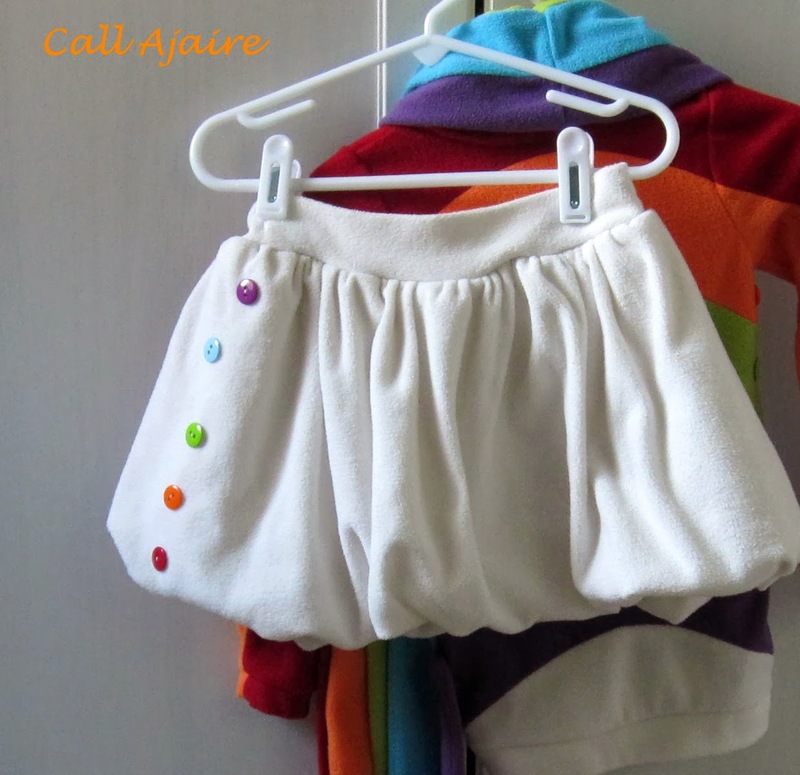 I used Simple Simon & Co.’s bubble skirt tutorial for the most part. The front waistband is flat, but there is elastic in the back. 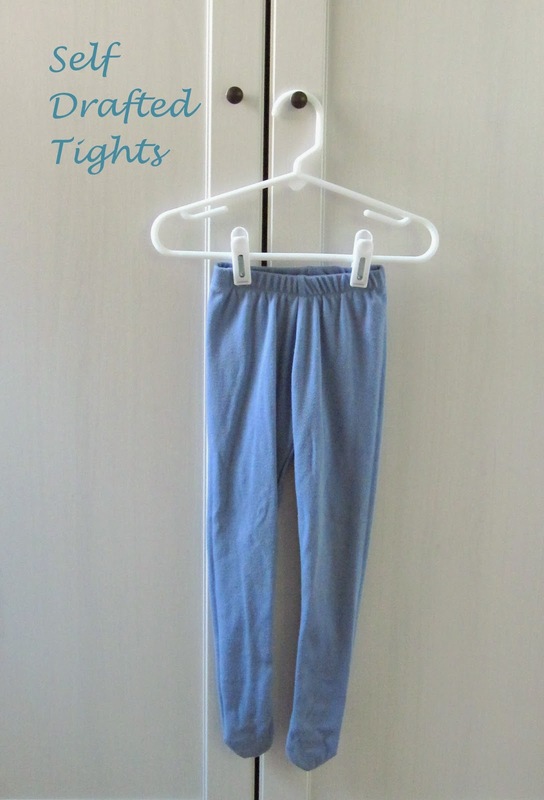 I also made a pair of blue tights from some leftover knit fabric I had. The pattern was self drafted when she was an infant and I just sized them up. I use the same pattern for leggings – minus the feet. 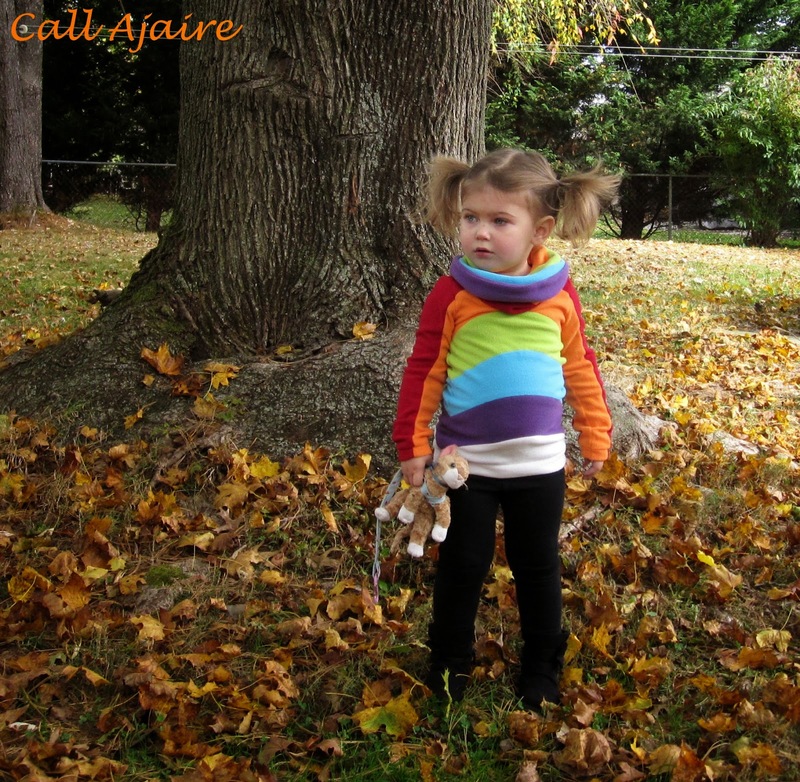 She will outgrow the length in about a minute, so I’ll just cut off the feet and make them leggings for the winter. 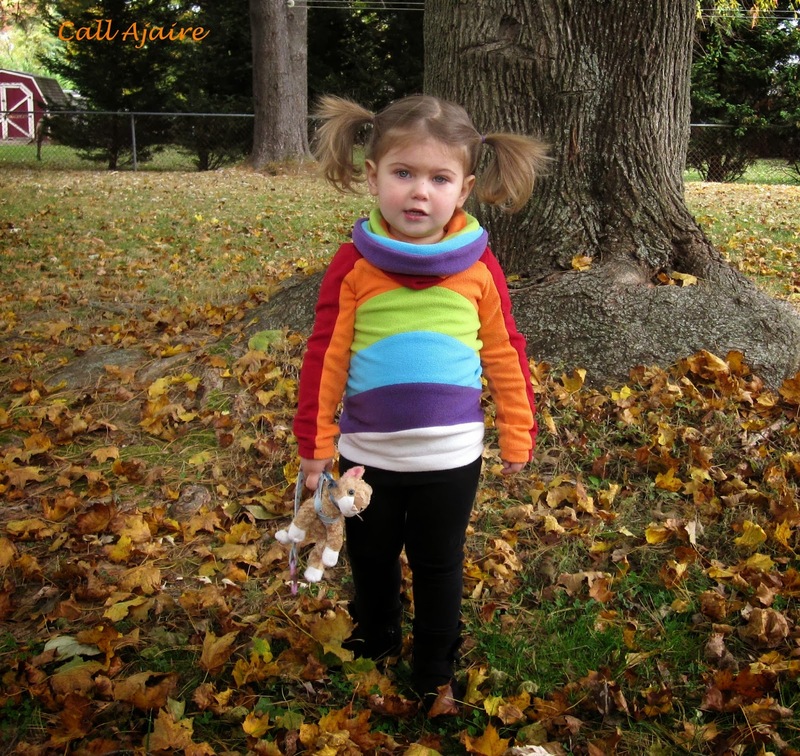 At the last minute Bean decided to be a Rainbow Princess so I quickly made a headband with a sun and some raindrops. If you follow my Instagram feed, you’ll have already seen that she now wears that headband while dancing in the living room. We visited friends in Michigan for the big day and had a lot of fun. 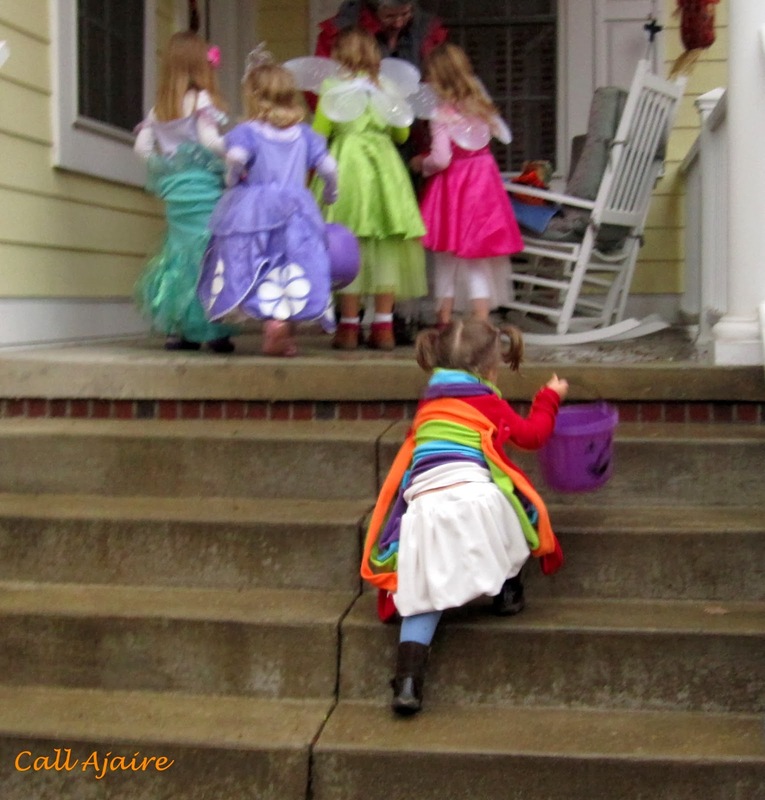 It was super rainy, but Bean really enjoyed the whole trick or treating anyway. 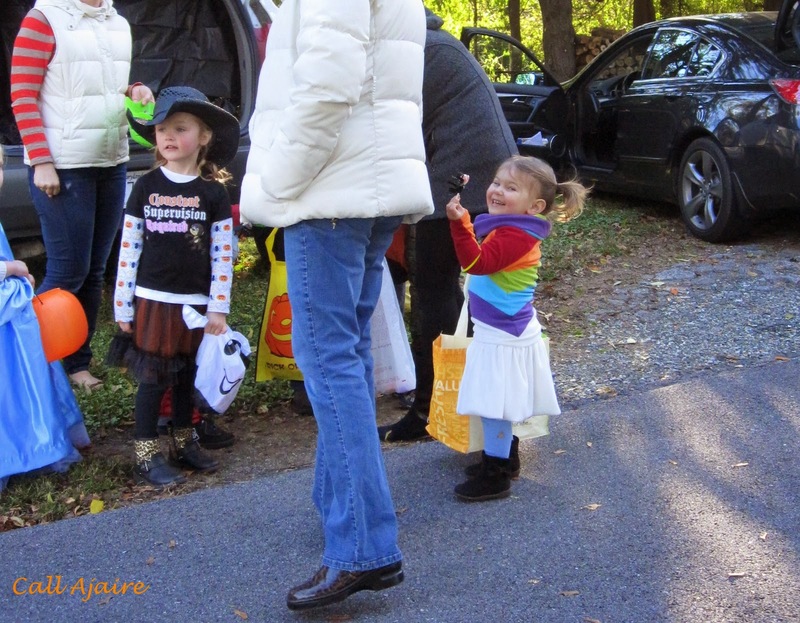 The picture above was from the trunk ‘r treat day so she’s not wet, but her face shows how excited she really was even in the rain on Halloween. She was determined to keep up with the older girls even though she’s not a champion stair climber. All of our stairs are still gated off so a whole neighborhood of stairs was a challenge for Bean. She did great though. Bonus, the sweater and skirt (minus the buttons) are two great wardrobe pieces for this winter. Yesterday it was super cold out, but that sweater really seemed to keep her warm. I really like how the colors pop with a pair of black pants. Yes, her kitty has a harness on. That’s Ozzie the Adventure Kitty and he gets strapped in when we go out so he doesn’t get lost. I use a carabiner to attach him to the stroller or our hiking backpack in case he decides to “fly to see the birds.” He’s marginally safe in our backyard, hehe. Back to the skirt, the microfleece is so soft, but really warm so the bubble skirt is perfect with leggings or tights underneath. I made three more microfleece bubble skirts for the girls in Michigan during Kids Clothes Week in October. It was actually a very productive KCW for me. I finished a lot of garments and really enjoyed it. So a productive period, though one with very little blogging. 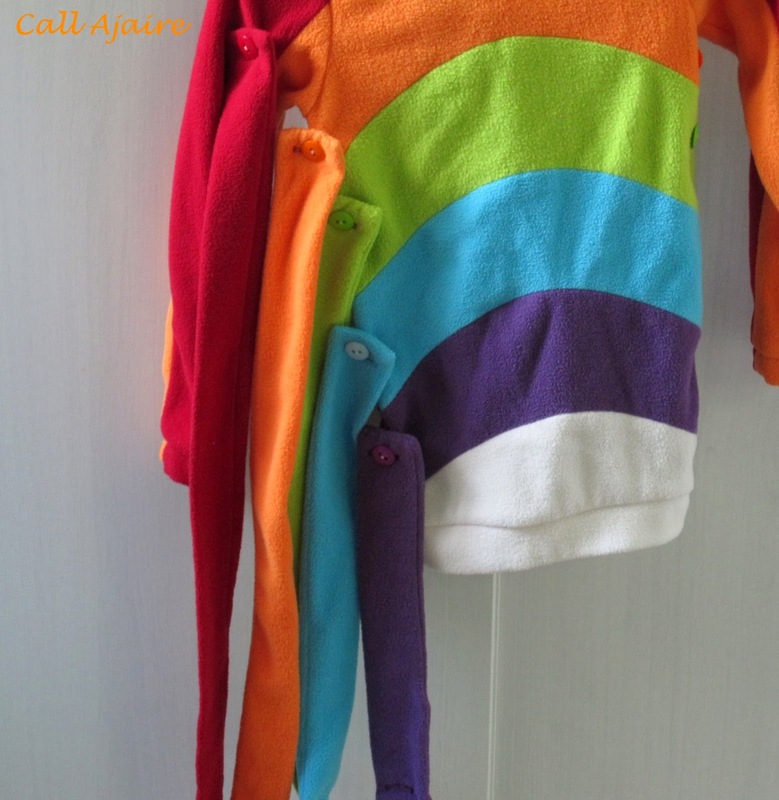 I have lots more coming up – including a post on Friday with pictures showing the other KCW garments – and I plan to stick to a better blogging schedule so you won’t have to read through these “catching up” posts as often, hehe. So cute! I've been wanting to see since I caught a glimpse on Instagram!! Adorable!! Love the picture where she's in full run mode, pigtails wild.